The more we learn about fetal development, the more advice women seem to get on what to do, and what to avoid, while pregnant. Of course, all this information can be overwhelming, especially when preparing for the arrival of your first child. While well-meaning friends and family will provide a constant stream of advice, expectant couples should rely on credible medical sources such as the CDC, the American College of Obstetricians and Gynecologists (ACOG), and the American College of Nurse Midwives. 1) Maternal vaccine recommendations serve a dual purpose. The first reason is to protect the mother. Changes in a woman’s immune, heart, and lung functions during pregnancy make her more likely to get ill and suffer severe complications from illnesses as compared to non-pregnant women. In fact, a pregnant woman is five times as likely to suffer complications or death from flu compared to non-pregnant women. Additionally, if a woman should fall ill during pregnancy, she has a greater chance of hospitalization, spontaneous abortion or complications that can directly impact the health of her baby such as preterm labor and delivery, and low birth weight babies. The second reason is to protect the baby. If a woman becomes sick before, during, or even shortly after delivery, she can easily pass a disease on to her baby. New moms spend a great deal of time in close proximity to their newborn babies, so it is understandable that they might share infections. But infections like flu and pertussis, also known as whooping cough, are not just a threat to a new mother. They can also be extremely dangerous, and even deadly, to young children. 2) Vaccination timing is important. Getting vaccinated during each pregnancy (as opposed to before or after) enables a woman to pass on protective antibodies to her developing baby that can then provide short-term protection against flu and pertussis until the baby is old enough to get their own vaccines. The best time for a pregnant woman to get a Tdap vaccine is between 27 and 36 weeks of each pregnancy, with the earlier part of this time period being most preferable. This preferred vaccination window is based on studies of the cord blood of babies whose mothers received Tdap vaccine in pregnancy and the associated levels of pertussis antibodies detected in that cord blood. Often times, adults are unaware that they have a pertussis infection, which is why the infection can easily be passed on to babies. Babies are especially vulnerable to the disease because they only begin getting their own DTaP vaccination to prevent pertussis at 2 months of age. But even then, they need an additional four doses at 4 months, between 6-9 months, between 12-15 months and again between age 4-5 before they are fully immunized. The antibodies they receive from their mother helps protect them in those early months after birth. 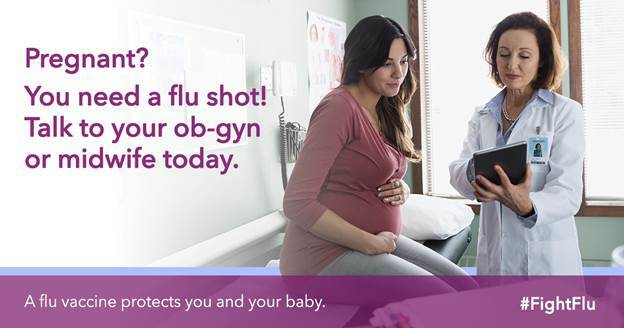 An inactivated flu shot is recommended for pregnant women at any trimester of each pregnancy. However, the best time to get a flu vaccine is before the season begins, so that the mother, who herself is at great risk of flu complications, is fully protected before flu activity begins to elevate in her community. . Since it takes about two weeks after vaccination for antibodies to develop in the body that protect against flu virus infection, it is best for pregnant women to get vaccinated by the end of October, if possible. Unfortunately, flu vaccines are not recommended until a child is 6 months of age, which is why the protection a child gets from his or her mother is critical to keeping that child flu-free until they can receive their own vaccine. 3) Maternal vaccines protect against two serious illnesses; whooping cough and flu. Whooping cough is a highly contagious respiratory disease that spreads easily from person-to-person through coughing and sneezing. Since symptoms can be less severe in vaccinated people, an adolescent or adult may easily confuse pertussis with a bad cold and persistent cough. Not knowing they are infected, they may unknowingly pass the infection on, which can result in a severe illness in an infant. Unlike a cold, pertussis infection doesn’t clear up in a week or so. The nasal congestion eventually turns into thick mucus that accumulates inside the airways causing periods of intense coughing. In young children, the cough can be so severe that it can cause a child to gag, turn blue, vomit or pass out. A gasp for air after a coughing fit can sometimes produce a loud “whoop” sound, though it is not uncommon to have whooping cough without producing the “whoop” sound. This intense coughing phase can last as long as 10 weeks. Seasonal influenza (flu) is caused by viruses which infect the respiratory tract and remains the leading cause of vaccine-preventable deaths in the United States. In children, the highest incidence of hospitalization due to influenza is among infants younger than 1 year, with those younger than 6 months at highest risk. 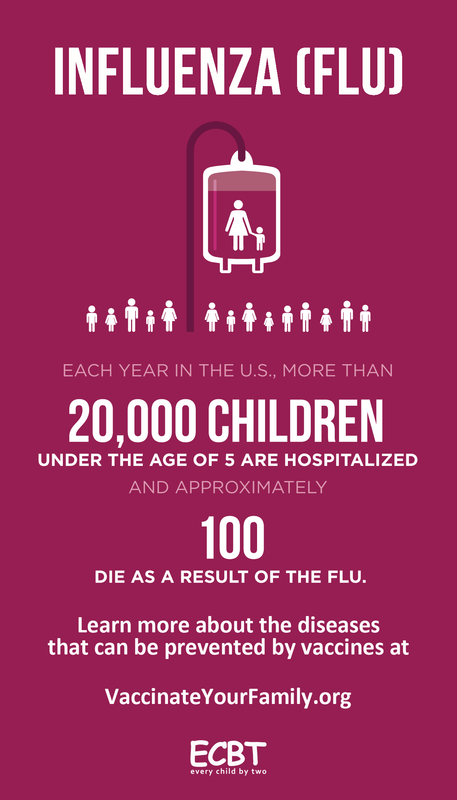 On average, about 100 children die from flu each year in the U.S. and thousands more are hospitalized. Even otherwise healthy individuals of all ages, including women of childbearing age, die or are hospitalized with flu each year in the U.S.
4) Maternal vaccines are safe. A review of reports to the Vaccine Adverse Reporting System (VAERS) (Moro et al, 2011) found no link between pregnancy complications or adverse fetal outcomes among pregnant women and flu shots. A study using Vaccine Safety Datalink (VSD) data (Irving et al, 2013) found no increased risk of miscarriage among pregnant women who received flu vaccines in the 2005-06 or 2006-07 flu seasons. A VSD study (Nordin et al, 2014) compared pregnant women who received the flu shot with an equal number of pregnant women who did not receive the flu shot during the 2004-05 and 2008-09 flu seasons, and found no differences between the two groups in the rates of premature delivery or small for gestational age infants. 5) Maternal vaccines are effective. 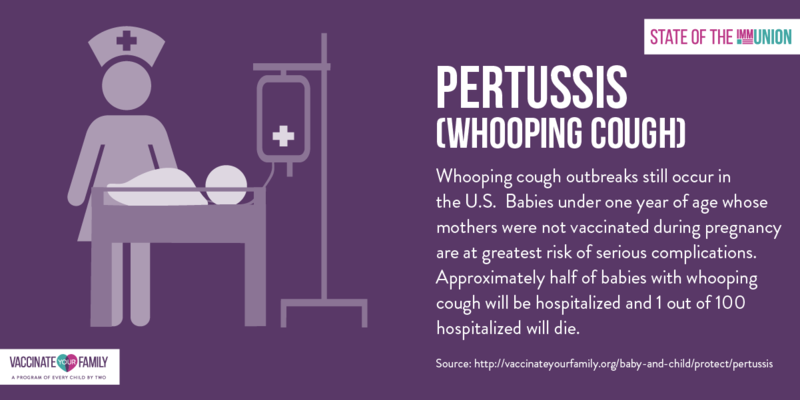 While we no longer see 200,000 cases of pertussis each year as we did before we had whooping cough vaccines, outbreaks still occur and there were more than 20,000 cases of whooping cough in the U.S. in 2015. However, studies confirm that young infants whose mothers got Tdap during pregnancy are less likely to develop pertussis during the first few critical months of life. Multiple studies from the United Kingdom suggest that vaccinating the mother during pregnancy protects up to 90% of infants against pertussis, and a U.S. study showed that infants whose mothers got Tdap during pregnancy had a significantly lower risk of hospitalization and intensive care admission. That same study showed that no infants born to vaccinated mothers required intubation or died of pertussis. Similarly, a recent study published in the journal Pediatrics showed that getting a flu vaccine during pregnancy reduced the risk of flu in infants in their first 6 months of life by as much as 70%, and reduced their likelihood of hospitalization by as much as 81%. It’s clear that maternal immunizations are a proven way for women to effectively protect their babies from flu and pertussis. Unfortunately, only about 50% of pregnant women in the U.S. are currently following the recommendations. While this number has been increasing, this means that half of all babies are still being born without protection from whooping cough and flu. If you know someone who is expecting, please share this information and ask them to consider talking to their provider about the need for flu and Tdap vaccines in pregnancy. This simple step can possibly save a child’s life.